Just in the AIX 2018 Vintage - get ready for the sun! It was 26 centuries ago, when the Greeks founded a colony in Marseille, that the first vines and wine growing culture were introduced in Provence. The wines made in those days had a light colour, similar to Rosés, because the maceration of juices with grape skins was either unknown or only practiced on a limited basis. Provence is therefore, the oldest wine growing region in France, and the first wines to be made were Rosés. Conditions in Provence have always been ideal for making beautiful wine. From mineral rich soils to an ideal elevation; from warm days and cool nights to mistral winds that dry vines on dewy mornings, the AOP Coteaux d’Aix en Provence was made for harvesting the indefectible blend of Grenache, Syrah and Cinsault that combine to build the rich, spicy notes of AIX Rosé. Ancient blending techniques used by the first winegrowers in France balance the nuanced qualities of each grape variety and fermentation at low temperatures preserves the aromas of the fruit. 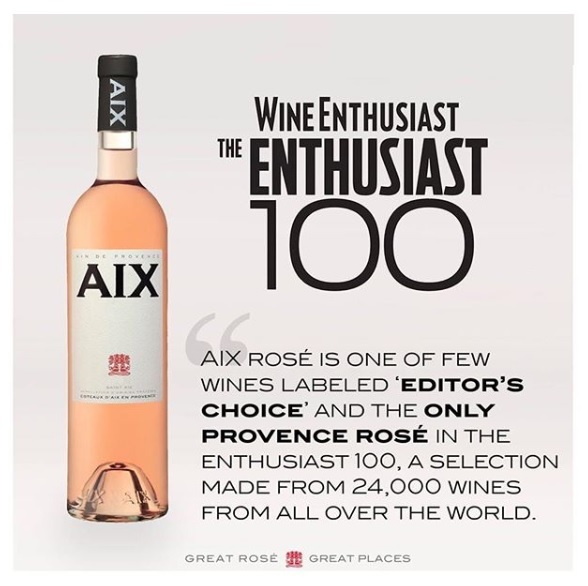 AIX is the original Rosé wine born in Aix-en-Provence. The inspired quality of AIX embraces that heritage and advances the legacy of a region famous for a flavour that matches fruit with freshness and pairs tradition with progress.